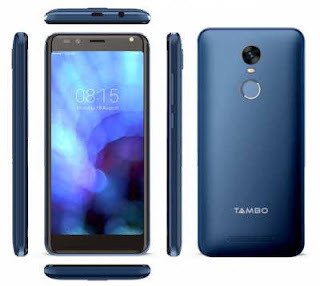 To raise the war among all low price smartphone manufacturers, Tambo Mobile, a Noida based entrant, has launched its flagship device "TA-3", in India on Wednesday. The Company taunting this phone as Superphone because of its features like Full View Display & Face Recognition. The smartphone is available for sale through all Tambo mobile retails partners from today onwards for Rs 4,999 Only in three different color options Jet Black, Champagne and Metallic Blue. Apart from these good features in low price company also offering 200 days replacement warranty and one time screen replacement with in 365 days of buying the smartphone. Tambo's TA-3 sports a 4.95 inch (480x960 pixels) FWVGA+, full vision display, with 2.5D curved glass on top for better protection . The smartphone is powered by Quadcore MediaTek 6737 processor coupled with Mali-T720 GPU, 1 GB of RAM & 16 GB of inbuilt storage that can be expendable upto 64GB via microSD card. The device runs on Android version 7.0 ( Nougat operating system) and houses a 2100mAh battery. For photography lovers, it offers 5 MP camera on rear side with dual led flash and 5MP selfie shooter with selfie flash for better selfies in dim light. The camera features includes face beauty, burst mode, panorama mode and stickers. The superphone offers fingerprint sensor & face unlock feature both which is another appreciable thing at this price range. Other Sensor includes Light sensor, Proximity sensor, Accelerometer. Connectivity options includes, 4G VoLTE enabled dual sim slot, Wi-Fi 802.11 b/g/n, Bluetooth 4.2, GPS, Micro USB port and 3.5mm audio jack. Tambo already had more than 600 service centers in India and it's aims to provide the 1000 service centers for better better after sale support by the end of 2018, company said in the release.